CALLING ALL ADULTS AND CRLS STUDENTS! Do you remember all the elements on the periodic table? How about the formula for determining the length of an arc on a circle? Who was that president who served after Grover Cleveland? Questions similar to these will be asked at the Cambridge Rindge and Latin Community Academic Challenge entitled “Are You As Smart As A CRLS Student?” on Wednesday, March 16 at 7:00pm. Mr. Billy Costa, a Cambridge High and Latin graduate and host of the WGBH-TV “High School Quiz Show” will be the moderator. The event is free and open to the public. "It was great fun for all, and wonderful to see so many parts of the Cambridge community come together to participate." This test of knowledge will be held in the school’s theatre. Members of community organizations, schools, businesses, CRLS alums and neighborhood groups are invited to enter teams of four colleagues to challenge teams of CRLS students in this exceptional battle of the brains. Individuals are also welcome to register by themselves and will join others that night in creating a team. Students are encouraged to create their own four person teams from their classes, clubs and athletic teams. Trophies for the adults and financial prizes for the students will be awarded. Please note; no life-lines, phone a friend or smart phones are allowed. The CRLS Jazz Combo will be performing between rounds and smart food refreshments will be served before the contest starts. For more information about the evening and to register your team (adults and students), contact Henry J. Lukas, retired CRLS Assistant Principal at henryjlukas@hotmail.com, 617-784-5838 or check www.crlsalumni.org. There is no registration fee. 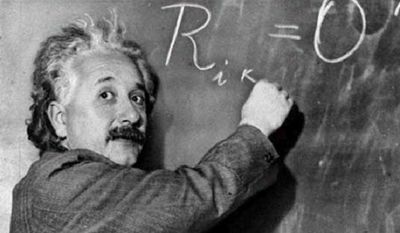 Comments Off on Are You As Smart As A CRLS Student? The Cambridge community is cordially invited to a grand opening celebration and tour of the city’s first near net zero school building. The Dr. Martin Luther King, Jr. School complex opened on December 21, 2015, and houses the Dr. Martin Luther King, Jr. Elementary School and the Putnam Avenue Upper School – as well as the Department of Human Service Programs’ Preschool, After-School, and Community School programs. Designed by Perkins Eastman, the building embodies Net Zero ideals and STEAM (Science, Technology, Engineering, Arts, and Math) in action. Throughout the building are embedded opportunities for students to explore the arts, sustainability, and engineering concepts – including math-themed interactive artwork and interpretive displays with signage illuminating the facility’s use of insulation and sustainable materials, consideration of natural light, and reliance on systems for solar energy collection, geothermal heating, and grey water reclamation. The construction manager for the 100 Putnam Avenue project was Rich-Caulfield a Joint Venture. Expected to achieve LEED-Platinum certification, the building is designed to generate an Energy Use Intensity 60% less than typical educational buildings in New England. LEED, or Leadership in Energy and Environmental Design, is an internationally recognized green building certification system by the U.S. Green Building Council. This new complex is the latest example of the City of Cambridge’s commitment to architecture that is both beautiful and sustainable. It is also the first in a multi-year, multi-school building program aimed at enhancing and improving the quality of learning environments for students in Cambridge Public Schools. 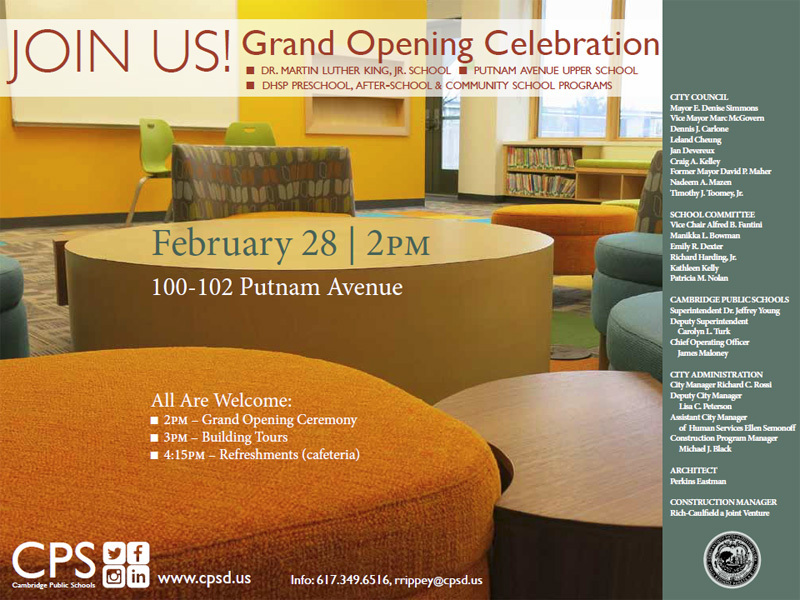 For more information on this event or the school building project, visit http://camb.ma/CPS-MLk.